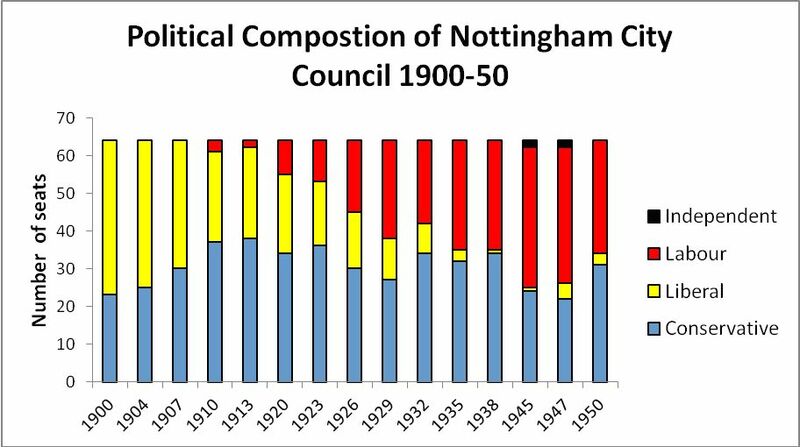 Twentieth-century Nottingham inherited a clearly delineated local party political system. For fifty years the city had been governed by a Liberal caucus of wealthy Gladstonian manufacturers. In turn, these leaders had supported a limited working-class candidacy to the party ranks. Local skilled trade unions, particularly, has similarly endorsed Lib/Lab candidacies in municipal elections, and in parliamentary elections. Yet from a position of open co-operation, where Liberal and Labour had previously operated an informal electoral truce, the years immediately preceding the First World War witnessed a political realignment of overt Conservative/Liberal collaboration that was to shape local politics in the city for the next thirty years. Two things stand out from this early period. Firstly, Labour's forward march before 1914 was distinctly low key. Finances were tight and electoral success illusive. The major change, however, lay elsewhere, with the rise to power of the Conservative Party. This dominance was to last until 1945. Its roots lay in both local and national factors: Liberal disarray at Westminster, and a lack progressive instinct within its Nottingham wards. Re-alignment in the city was to see the two traditional parties banded together in an 'anti-Socialist' pact, of a kind also common elsewhere, across the inter-war era. There is little doubting that this operated to the benefit of the increasingly dominant Conservative Party, with the Liberals perpetually operating in the shadows of their partners. 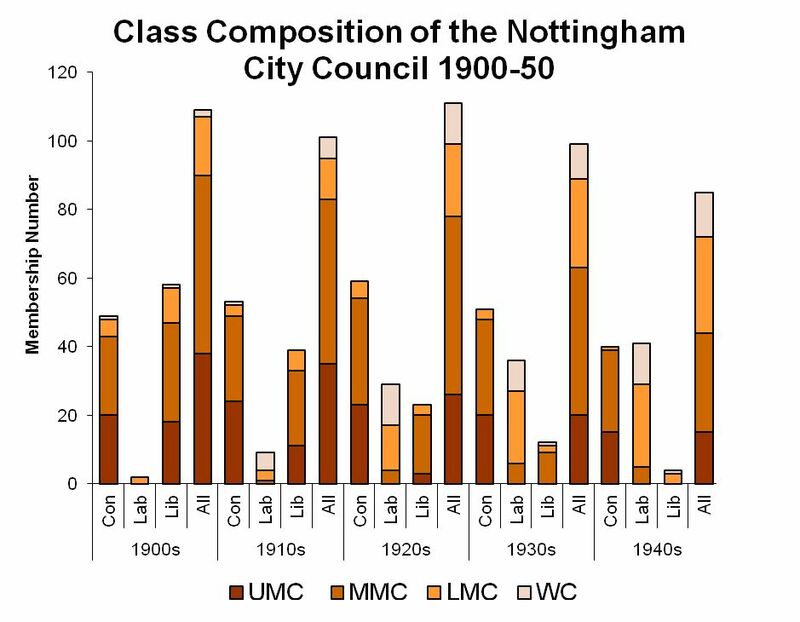 Working-class wards, even those with strong non-conformist antecedents, moved to Labour, while middle-class wards became Conservative territory. This was not a party whose councillors were drawn ranks of the lower-middle shopocracy, but instead consisted of men and women of substance. Moreover, while many espoused the virtues of financial rectitude and minimalist intervention, there were more still within their ranks that were also socially progressive, so that in policy areas like social housing and education the city acquired a national reputation. 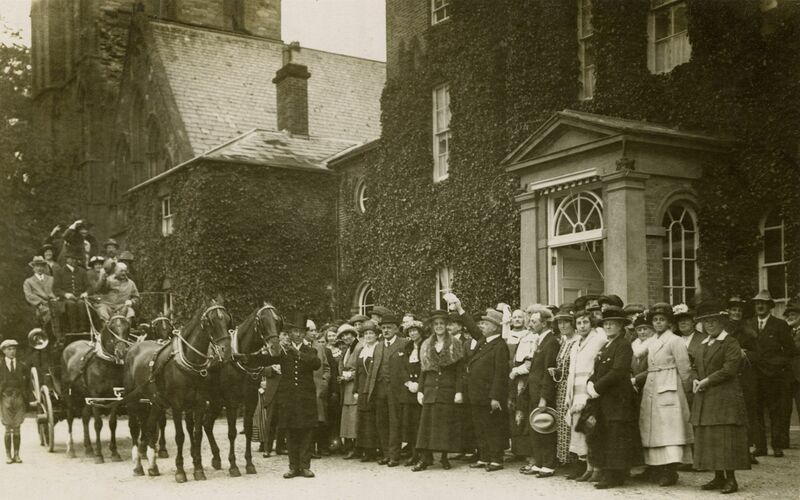 For Labour, the inter-war period brought increasing rewards, not only in terms of seats but also influence, in a period that remained fluid in its direction. The existence of an ‘anti-Socialist’ electoral pact needs to set against one of the most comprehensive formal agreements of co-operative power-sharing operating in English local government. Growing strength, coupled with Liberal atrophy, meant that by 1929 Labour was within a whisper of becoming the largest party on the council. The national debacle overseen by the second minority government at Westminster halted temporarily that advance. By 1938 the Liberal Party had all but disappeared, and Labour support had reached an all-time high, but, as in many large towns and cities in England, the Conservatives remained the largest party. Only after the war was this to change and to change substantially.